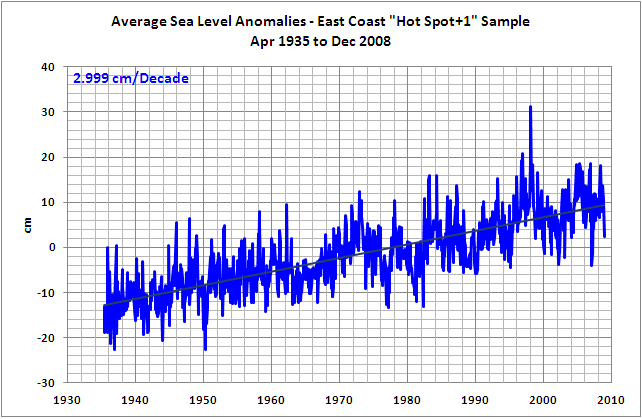 Cooling that Atlantic Coast sea level hotspot | Watts Up With That? John Droz Jr. asked me to comment on the Sallenger et al (2012) paper Hotspot of Accelerated Sea Level Rise on the Atlantic Coast of North America. As you’ll recall, John Droz Jr. has reported on pending North Carolina legislation about rising sea level. Refer to the WattsUpWithThat posts here and here. Apparently, North Carolina lawmakers are concerned about the use of the word “accelerated” in Sallenger et al (2012). 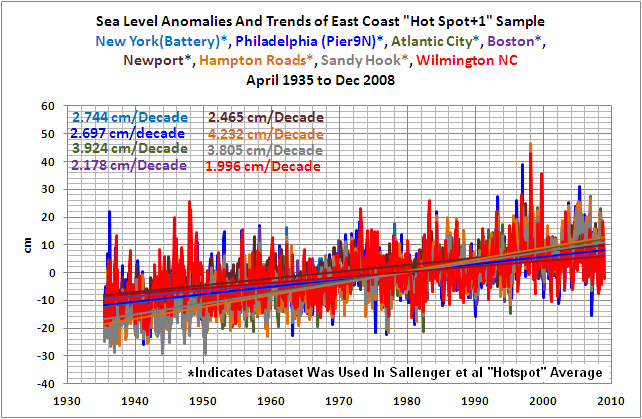 So I took an initial look at the sea level data for the Atlantic Coast “Hotspot”. The shift in trends around 1990 noted in Sallenger et al (2012) appears to be a function of the natural variability of the North Atlantic. In regard to the role of cycles, the single ~ 60-yr pattern in Fig. 4a does not seem associated with 10–30 yr sea-level variations discussed in ref. 27. With our limited series length, the presence of cycles, for example associated with natural ocean variability and/or AMO, is indeterminate. In the Holocene geologic record of an NEH marsh, the authors of ref. 28found evidence of several rapid SLR increases separated by 900 yr or more that they associated with gyre changes. Regardless, our correlations suggest that should temperatures rise in the twenty-first century as projected, the NEH SLRD will continue to increase. If future sea-level variability is forced by aerosols and/or is part of a cycle, SLR in the NEH may also alternately fall below and rise above projections of IPCC scenarios alone. Our analyses support a recent acceleration of SLR on ~ 1,000 km of the east coast of North America north of Cape Hatteras. This hotspot is consistent with SLR associated with a slowdown of AMOC. In other words, Sallenger et al (2012) note there is an accelerated rate at which sea level is rising for a portion of the Atlantic coast of the United States, starting around 1990, but they don’t know the cause. In the opening sentence of the above quote, they comment about the observed 60-year cycles in the Atlantic Multidecadal Oscillation and how they do not agree with the results of their reference 27, which is Frankcombe and Dijkstra (2009) Coherent multidecadal variability in North Atlantic sea level. Tide gauge records from around the North Atlantic are examined and found to show variability on 20–30 year time scales. Sea surface height variability along the western boundary of the North Atlantic shows a particularly strong and coherent signal. Similar variability is also found in an ensemble of runs using a state-of-the-art climate model (GFDL CM2.1). This sea surface height variability is linked to variability of temperatures in the upper layers of the ocean and thence to the Atlantic Multidecadal Oscillation. The variability is consistent with the excited internal ocean mode mechanism of multidecadal variability derived from idealised models and the timescale is consistent with that derived from observations of sub-surface temperature variability. The long tide gauge records analysed here certainly point to the importance of the 20–30 year period over the 50–70 year period more commonly associated with the AMO. Immediately, one wants to examine a time-series graph of the “Hotspot” sea level data in the Sallenger et al (2012) paper to get an idea of what the multidecadal variability in the data looks like. If there’s a 20-30 cycle in the data, and if the last cycle started in 1990, then odds are the cycle has already peaked and has started back down again. Also, picking the last break point in a dataset with known multidecadal variability, adding before and after trends to the data, and then stating the data during the last period has accelerated has a familiar ring to it. It sounds very similar to the nonsensical tactic the IPCC tried in FAQ 3.1 Figure 1 from their 4thAssessment Report to show that global surface temperatures were warming at an accelerated rate. 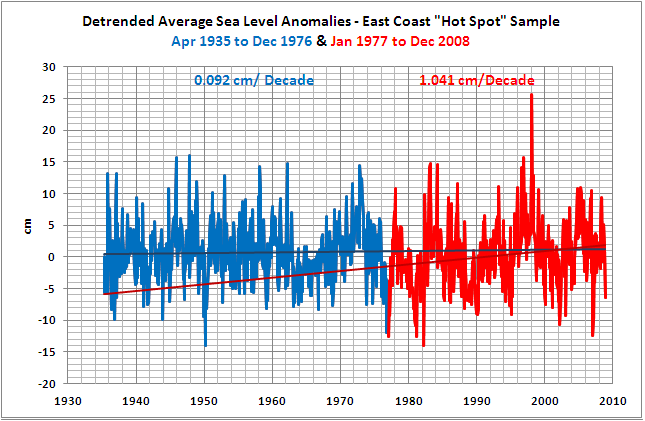 Curiously, there were no time-series graphs of the “hotspot” sea level anomalies in Sallenger et al (2012). That raises the question: what didn’t they want to show? 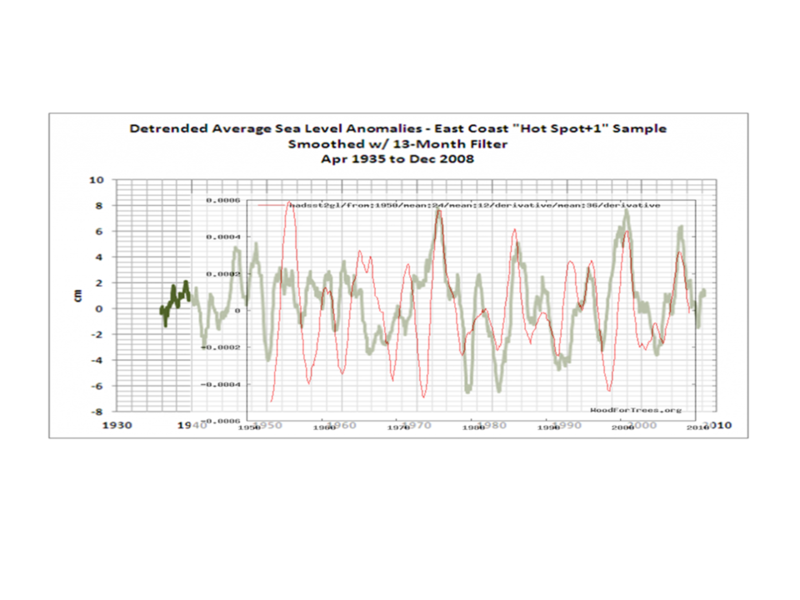 To determine the multidecadal signal in the East Coast “Hotspot” sea level data, I downloaded Permanent Service for Mean Sea Level (PSMSL) tidal gage-based sea level data, same dataset used in Sallenger et al (2012), from the KNMI Climate Explorer. It can be found there on their Monthly station datawebpage. As you many of you are aware, the tidal gage-based sea level data is sparse, rarely continuous, and few have more than a few decades of data. In other words, it’s troublesome to work with, which is one of the reasons I rarely look at sea level data. So I selected the stations with the longest data, 70 years or more, along the Atlantic coast that were included in the “hot-spot” group of Sallenger et al (2012), from North Carolina to Massachusetts, that were also relatively continuous; that is, they did not have a lot of missing data. They included New York (Battery), Philadelphia (Pier9N), Atlantic City, Boston, Newport, Hampton Roads, and Sandy Hook. Since John Droz was interested in North Carolina, I added Wilmington, NC to the mix. We’ll call the combination of those datasets “Hotspot+1”. The Wilmington data had the shortest term, so it set the start year of 1935. Not too surprisingly, it had the lowest trend from 1935 to 2008. Refer to Figure 1. However, since we’re going to detrend the data, its lower trend would have little influence on this preliminary look at the East Coast sea level data. Note: The PSMSL data at the KNMI climate Explorer ends in 2008. Sallenger et al (2012) ended their analyses in 2009, so we’ve only lost a year. Figure 2 presents the average sea level anomalies of those “Hotspot+1” stations along with the linear trend. Assuming the average sea level anomalies of the 8 stations used in this presentation provide a curve that’s similar to the stations Sallenger et al (2012) used for their “Hotspot”, this may illustrate the reason why Sallenger et al (2012) excluded a time series graph for their average “Hotspot” sea level data. 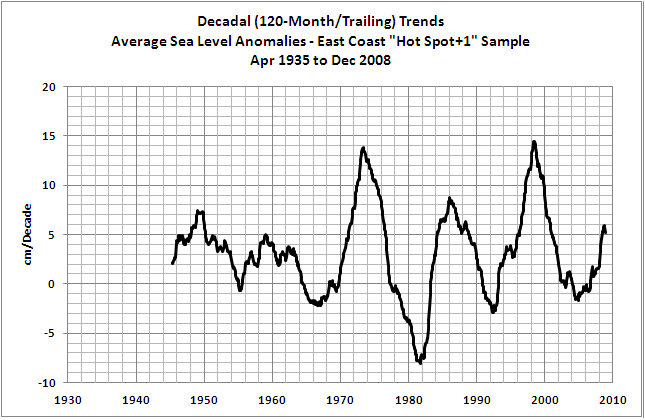 It appears sea level anomalies for the “Hotspot+1” stations have been relatively flat since about 1996. Since one of the points being discussed is decadal to multidecadal variability, we’ll detrend the “Hotspot+1” average, to help show if it exists. 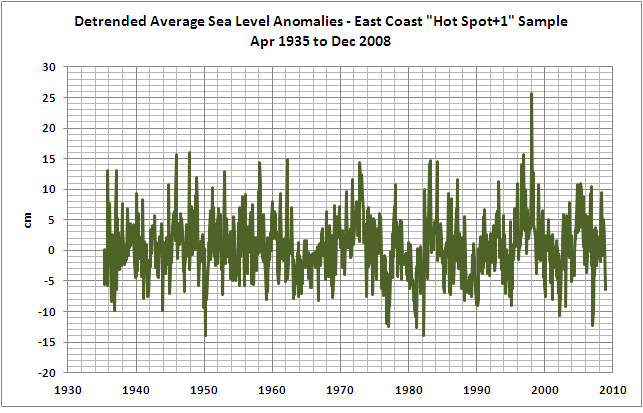 Figure 3 presents the detrended average of the “Hotspot+1” sea level anomalies. First things first: Is there a break point around 1990 when the trends shift? There is definitely a shift in trends before and after 1989/90 in the detrended “Hotspot+1” sea level data, Figure 4. There are also comparable shifts in trend around 1976/77 and about 1981/82, Figure 5 and 6. But Sallenger et al (2012) went through a detailed analysis and elected to discuss the shift around 1990. I’ve filtered the detrended “Hotspot+1” average sea level anomalies with a 13-month running-average filter (centered on the 7thmonth) in Figure 7 to reduce the month-to-month variability. The spikes in 1972/73 and 1997/98 may lead one to believe that El Niño-Southern Oscillation (ENSO) events have a major influence on it. Whatever is causing the sea level anomalies to vary, there is a multidecadal signal visible in the detrended “Hotspot+1” sea level anomalies. See Figure 8. In it, I’ve smoothed the data with a 121-month running-average filter, which is commonly used when illustrating decadal and multidecadal variability like the Atlantic Multidecadal Oscillation. Now we can understand why Sallenger et al (2012) were discussing a multidecadal signal. One very plainly exists. Looking at the trailing decadal (120-month) trends, Figure 9, we can see very clearly that the trend of the most recent decade (through December 2008) is not as high as it has been in the past. Also note that the peaks in the decadal trends occurred about the time of the three largest El Niño events that weren’t counteracted by volcanic aerosols. They were the El Niño events of 1972/73, 1986/87/88 and 1997/98. The eruption of El Chichon occurred at the same time as the 1982/83 El Niño and likely offset the effects of that El Niño-Southern Oscillation (ENSO) event on the sea level anomaly trends. Oddly, ENSO isn’t mentioned in Sallenger et al (2012). Volcanic aerosols are mentioned in the closing of Sallenger et al (2012), however. Are the volcanic eruptions of El Chichon in 1982 and of Mount Pinatubo in 1991 the reasons for the low, actually negative, decadal sea level trends around the same time? If so, why did sea level trends drop in the early 2000s? 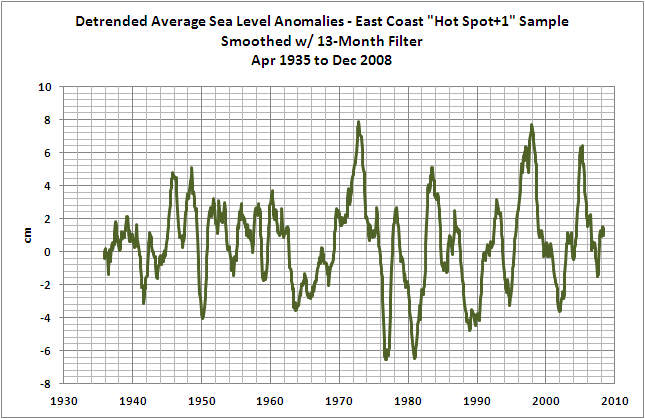 What about the Wilmington, NC sea level anomalies? The sea level anomalies of Wilmington have a relatively low linear trend compared to the long-term stations used by Sallenger et al (2012). Refer back to Figure 1. 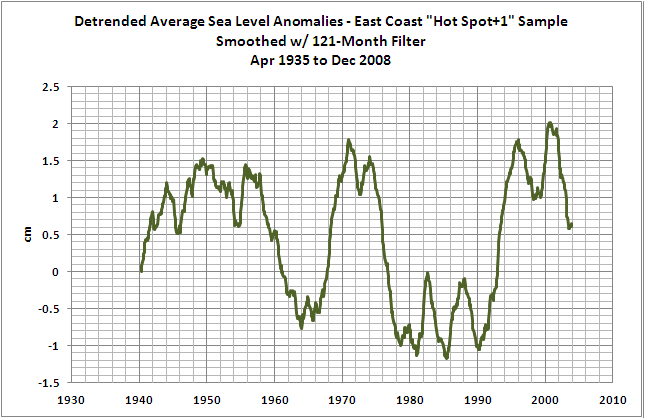 Looking at the detrended Wilmington sea level data when smoothed with a 121-month filter, they have a different multidecadal signal than the “Hotspot” average. See Figure 10. The latest upswing started about 1976, then peaked near 1996, and the downswing was still in progress though the end of 2008. 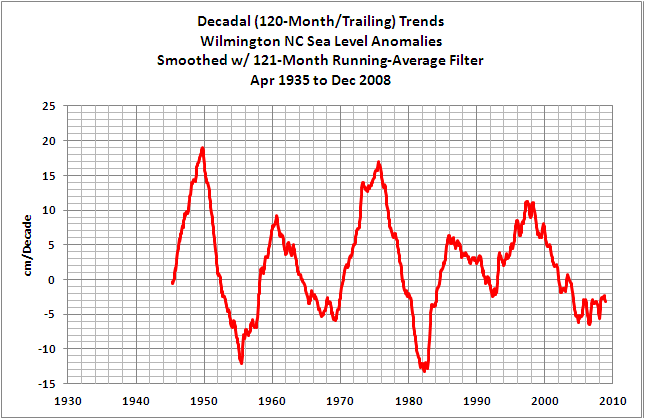 The running decadal trends for Wilmington, Figure 11, reveal they have been negative since 2002. 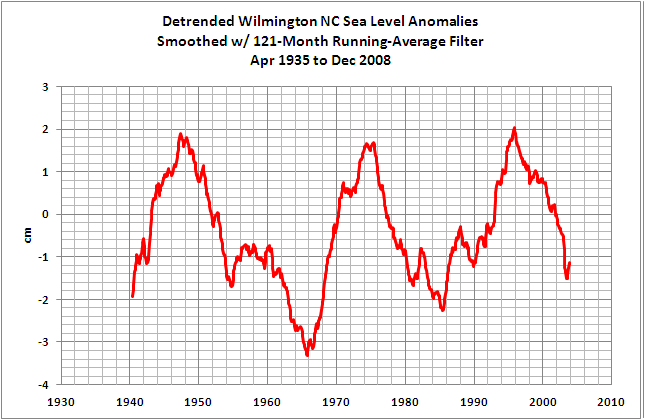 That is, on a decadal basis, sea level anomalies in Wilmington have been falling, not rising, since 2002. Have they risen since 2008? It makes one wonder why Sallenger et al (2012) chose to exclude the last few years of data from their analyses! The source of the data presented in this post is the KNMI Climate Explorer, specifically their Monthly station data. North Carolina is considering new legislation about the rise is sea level. It would be a shame if the incomplete analysis and data presentation by Sallenger et al (2012) and their use of the word “accelerated” influenced it. My book If the IPCC was Selling Manmade Global Warming as a Product, Would the FTC Stop their deceptive Ads? is available in pdf and Kindle editions. An overview of my book is provided in the above-linked post. Amazon also provides a Kindle preview that runs from the introduction through a good portion of Section 2. That’s about the first 15% of it. Refer also to the introduction, table of contents, and closing in pdf form here. I continue to make progress on my upcoming book about El Niño-Southern Oscillation and hope to publish pdf and Kindle editions by late July, early August 2012. Try controling for ENSO via the multivariate ENSO index. You can also control for the AMO the same way. This will give a relatively pure underlying SLR trend. Bob, re your books: get some advice on titling. Your first book title tells the whole story and has the flavour of a partisan, activist-type harangue. Your excellent analyses and illustrations would be read by a lot more people if you had a more neutral, matter-of-fact title. I can accept that due to gravity winds and currents one part of the ocean can be higher than another but for one part to rise faster than another one of these factors will have to change too. If not the bulge will rapidly disperse. That seems so obvious that it shouldn’t need to be posted. A few editing comments: you are missing the captions for figures 4 and 5, also in your closing you state,”about the rise is sea level.” should it be, “about the rise of sea level.”? Great work as usual !! “What didn’t they want to show” Volumes 1 through 6 !! Just days ago, a claim of 1 foot sea level rise in California in 10 years has started being promoted. In fact, sea level had an average rise rate per year which was as much in the late 19th century as a century later, despite how human emissions rose by more than a factor of 10 over the period. Regarding California sea level in particular, the San Diego measurement station history is shown in the publication linked above. Sea level also responds to atmospheric pressure. Has anyone looked to see if there were more low or high pressure systems than usual at various times during this period? I would consider such a book as yours as necessary in a private library as books on solar dynamics. Not because I think there is much connection between solar dynamics and warming or cooling trends, but because the everyday citizen most decidely needs to be and stay informed about the natural universe that surrounds us. Just the facts as usual, keep it up! there’s a make or break confluence of events coming up in the fall and in 2013 that will break the backs of these manipulators and especially their Powerful political backers and paymasters. Hint USA and Australian elections and the continuing slide down the drain of the EU. hmmm… couldn’t find their data huh? Maybe they are just saying coded alleGorically that America’s east coast is beginning to lean to the right, and it’s accelerating, especially in the Carolinas?? Sounds right, but overall definitely leaning to the right. ;). claim of far higher rise in California is just misleading junk at best as usual. My grandfather built a castle on this swamp and it sunk . My father built a castle on this swamp and it sunk . I built a castle on this swamp and it’s sinking. Subsidence all the way down. My impression is first of all, the authors take as granted that global warming will have an detectable impact on sea level rise. But neither is this proven despite the physical fact, that warmer water will have a bigger voume than colder water, but other factors are much more powerful to change of sea level. Looking to the rest, all what the authors of said paper did is cherry picking using the platitude of deviations from mean and call this in case it agrees with their assumptions a “hotspot” and comparison with model results. Is this real science? I do not want to bore somebody because one know as well as everybody that GMSL is a (by what ever methods better, to say tricks tricks) calculated the mean of local sea levels. I.e. some must be higher (I call it now a “hotspot”) than the global mean, some must be lower. In case they are higher let´s call them “hotspots”. If one would look would to Bangkok or Manila one will see that the hotspot there is much “hotter” (increase of about 1 m in the last 40 years, in Bangkok, unfortunately right now not so easily available on PMSL page as a graph but look here http://www.psmsl.org/train_and_info/geo_signals/) than their specimen “North American Atlantic coast north of Cape Hatteras”. And if they would have compared it with Stockholm ( with a decline of – 3,4 mm/year here http://www.psmsl.org/data/obtaining/stations/78.php) with a decline than they would have seen that this is an example for descending sea level. Or with Triest (http://www.psmsl.org/data/obtaining/stations/154.php) with an increase. In all cases all the variations are rather plausibly explained, but real evidence for this explanations are rare. Finally I saw that the first reference is Levermann, A., Griesel, A., Hofmann, M., Montoya, M. & Rahmstorf, S. Dynamic sea level changes following changes in the thermohaline circulation. Clim. Dynam. 24, 347–354 (2005). This people had shown too often, (see Rahmstorf, S a (2007). A semi-empirical approach to projecting future sea-level rise. Science 315:368-370*.) that they love to fudge the results unit they fit. It devaluates every scientific paper which use them a reference. There must be a “Super Moon” out there…………………….. I too wonder about sea level rise and coastal subsidence (and john’s ancestorial IQ score handed down from grandfather, to father, to son related to castle building ;>)). Given that GPS has only been available recently, it may not be useful in this instance. But it would be interesting to see if there are any SLR records that could be compared to GPS land data. Of course, ideally they would have to be right next to each other. Off topic but speaking of “Super Moons”, the annular eclipse print was just delivered. Thanks. The geological literature holds the explanation for what has been observed again in the Sallenger et al. (2012) paper. That is, past glaciation of the Northern Hemisphere caused the region to be loaded with the weight of the glacial ice. This in turn caused the extremely viscous mantle below the glacial ice to flow outward and cause a forebulge in the non-ice covered area to the south. After the climate warmed and the ice melted, the process of isostacy began to return the region to equilibrium surface elevations; the formerly ice covered areas began to rise and the forebulge to the south began to be lowered. The coast along Maryland and Virginia has shown the greatest decrease in land surface elevation, which can be mistaken for sea level rise if one is not familiar with the geological history and processes of the area. Unfortunately, this information is contained in things called books! many of which can be found in the library of the US Geological Survey. With regard to the figure from Sallenger et al (2012), if you reverse the sense of the displacement, you will have a fair picture of the process of isostasy; blue indicating land surface moving up and yellow and orange demarking land surface elevation decrease. then write it all up and wait for pal-review to be processed before publishing, surely this qualifies as a rapid backing-up of another exuded product from the undisputed King of the Hockey Sticks. Fully justified as last year’s Mannian output was quickly torn apart by skeptics and desperately needed quick reinforcing, of course. Funny, I thought alarmists usually quoted ~3mm as the annual global sealevel rise. Which happens to be the same level which is suposedly 3-4 times the global level in the east coast. Folks who live around the Houston area such as Baytown know well that since Houston is pumping water out from underground that there is massive subsidence of the land. I was half way listening to NPR Science Friday. They had someone speaking on this and he was claiming that the rise was related to Coriolis forces and the Gulf Stream. I wasn’t paying close attention so I don’t know exactly what he was trying to say. I have to agree strongly with Bruce Hemingway. Simple geology knowledge of the East Coast, one would know why the barrier beach coasts are sinking and the rocky coasts are rising. Bob, your map/chart with the amount of rise (in color) just pops out at one. Yes, it is the land sinking. Actual satellite measured Sea level rise in N.C. is 1/2 the global average. http://stevengoddard.wordpress.com/2012/06/27/north-carolina-sea-level-rising-at-less-than-one-half-of-the-global-average-rate/ So the CAGW noon- scientist go to a sinking land mass, and then cherry pick thir time frames. Buisness as usuall. I am a social worker that has been following WUWT daily for 4 years. . Last Fall, the Grace satellite showed a strong + gravitational variance in the area of the Atlantic sea mounts off the coast of New York stretching into the North Atlantic. I don’t know to what degree a strong + gravitational variance would have on ocean levels other than to compress the ocean cause it to lift up in areas of weaker gravity. Take a look at the Grace Site. http://www.csr.utexas.edu/grace/science/technical. 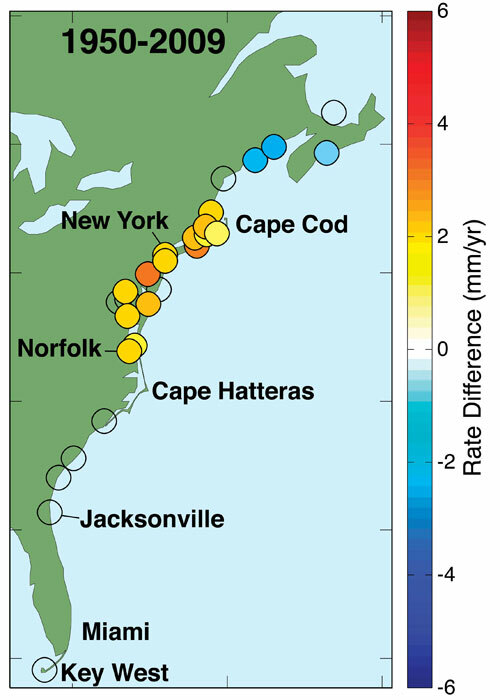 There is an excellent graphic combining gravitational variance and sea level in the area of the east coast in question. I am remembering High School physics. How do you get the ocean to bubble up in one place and not the another? Liquids seek their own level. If the ocean is rising on the east coast of the US, but not on the south coast or the west coast, there is some other mechanism in effect other than world wide sea level rise! Wouldn’t a quadratic trend analysis spanning the multidecadal series be more appropriate to uncover any real acceleration (positive or negative)? Deflates their own paper somewhat, I would have thought. That can happen and probably does. But the primary cause of differences in sea level rise seems to be that the oceans appear to be slopping around a bit in their basins on a multiyear basis for reasons we don’t completely have a handle on — e.g. winds, currents, weather patterns. Thus if you map observed sea level rise you will probably find that the sea is rising in some places and falling in others. Map it again a decade later and the map will have changed. Check out cddis.gsfc.nasa.gov/lw13/docs/papers/sci_scharroo_1m.pdf and look at the picture on page 5 that shows sea level changes in the 1995-2002 timeframe. as measured by the ERS2 satellite. Neither of the current North American hot spots shows up much. And my guess is that in 20 years or so, they won’t be “hot” any more. I’m coming to believe that until climate “science” gets around to properly observing the constant changes in rate of sea level rise and develops proper metrics for dealing with them, we can expect to see lots of studies with dubious conclusions. The claimed “acceleration” is almost entirely an artefact of the start and end dates of the “windows” used. Annual averages were used, and therefore for the 1990-2009 “window” focussed on in the abstract to the paper (but not in the supplement to the paper, which focussed on 1980-2009) just 20 data-points were available. Both 1980 and 1990 were at low points in the record for all stations used; by accident or design, this amounts to “cherry-picking”. Moving the window start dates back by just a few years causes the “acceleration” to disappear entirely, or almost entirely. The USGS has effectively created a “hockey-stick” where the very existence of the “blade” depends on the length of the handle. Since there is no “Weather is not climate” meme associated with sea level, these Einsteins decide to go regional on it. Perhaps the global seems too linear for a scare. Even then they have to do the climatology data rope-a-dope. It is the understanding of the physical relations of the heat current of the climate dynamics in general. Because a heat current ever is floating from warm to cold and the major heat source is the sun, the first question is, what are the reasons for the multifrequent global temperature spectrum with magnitudes of about 8K and non sinusoid time functions. The frequency range can be measured from 1/26 My^-1 over 1/91ky^-1 to about 1/0.2 y^-1. It is well known, that the temperature rise 20 ky ago, which is still on this level has melted the ice from the poles which results in a big SLR until today. The softly decreasing temperature in the last 7ky of about 2K has flattened the SLR to a value of ~ +3 mm per year. But superimposed on this flat increasing function are still oscillations of frequencies of about 1/900 y^-1 to 1/0.2 y^-1 visible. Mostly all oscillation frequencies can be explained with synodic functions in the solar system. This is shown in a comparison of the global temperature and the detrended (+3 mm/y) SLR and a comparison of the detrended (+3 mm/y) SLR and a sum of synodic functions in the solar system. The main frequency in the detrended sea level curve is clear visible and spikes can also be found in the temperature curve, but smoothed by a lower frequency function. The lower frequency function can be simulated using 3 synodic solar functions. A comparison of the UAH temperatures solar function using 11 synodic functions in sum shows a positive correlation. The ~ 1/900 year function can be shown by only one synodic function of Pluto and Quaoar. I do not understand all this band pass filtering. It kills the truth of the data. Or the water is being heated by the hotspot and expanding. It’s worse that we thought! So if you get an influx of rabid warmists – you know who to blame. Sorry. Who cares about day or two ? The whole concept of differential sea level rise is anti science ! Even the BBC recognizes that “sinking cities” are the cause of “sea level rise”. Dams don’t just block water flow. … Perhaps the most problematic result of this loss of sediment replenishment can be seen in deltas, often host to large cities, which are literally sinking into the oceans. Groundwater is being extracted to feed the city – in part because the river volume is no longer adequate to meet the need – causing the urban weight to sink, and sediments washed away by the ocean are no longer being replaced. The result is sea level rise in cities from Shanghai to Alexandria. Chance to display my ignorance again, but just how is the sea level measured at these “hot spots”? Are they guaging stations in stillwells? Is it possible that they suffer from artificial influences based on their location? The wakes from passing ships? Were the types of instuments changed and/or upgraded in the ’90s? I suspect that many people, perhaps conditioned by what happens when they keep their foot on the ‘accelerator’ pedal of their automobiles, use that word ‘accelerating’ to mean simply increasing or going forward, instead of the technical meaning of increasing or going forward at an ever more rapid rate. Some linguists hold that the public at large are the final arbiters of the real meaning of all words. Of course, anyone who has passed a course in high school physics should know the difference. And how does tectonics play in all of this? Mid Atlantic ridge is pushing North America west, while the Pacific Plate is countering that with an eastward push. It is known in other parts of the world (the UK for example) that continental plates can be cantered, up one side, and down on the opposite like a teeter totter. So the Atlantic shore line could be sinking, especially since the rate of sea level rise is higher there than the average for the rest of the planet (1.74mm/yr).